It’s been a few years since I’ve done the holiday gift knitting thing. At some point it started to feel more like a burden than a joy, so I made the decision to take deadline pressure out of the equation, which helped me to enjoy the holidays much more in recent years. This year though, I had a strong urge to spend the month of December doing some “vacation” knitting (i.e. not writing a pattern, taking measurements, planning shaping details, or any of the other technicalities that so often accompany my knitting time) with a low-commitment, pre-existing design. Hats are one of my favorite things to knit, so I picked a pattern and started stitching. I figured I’d see how many I could complete within the month of December without setting any sort of “achievement metric” — if it turned out I was only able to finish a single hat in the month, I’d still consider it a win. The irony about time-pressure is that when you release yourself from it, you often produce more than you may have if kept on a strict output schedule. (This is at least true for the way my brain works.) In the end, I got so into the swing of hat knitting that I finished seven of them in four weeks. Definitely a personal record! 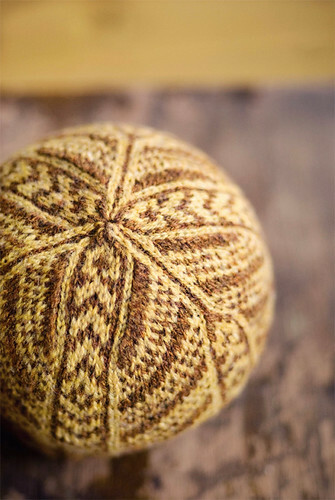 I chose to work with my Burnaby hat pattern, which coincidentally gave me the opportunity to knit with several shades of Arbor that I hadn’t yet gotten to try out (at least on anything more substantial than a swatch). Repeating a project over and over again has a meditative appeal for me. Along with the satisfaction of committing a pattern to memory (a fun party trick…depending on the party), I also enjoyed making subtle tweaks to each version: varying hat length and adjusting fit and fabric density through the use of different needle sizes (sometimes 3-4 different sizes in a single hat). Small details, to be sure, but seriously satisfying. Another thing I forgot: how rewarding it is to watch friends and family open up a wrapped handknit gift. I’ve listed the colors of Arbor that I used for each hat above. Though I picked colors based on my best prediction for each recipient’s tastes, the hats actually came together to make a nice little color story of their own! 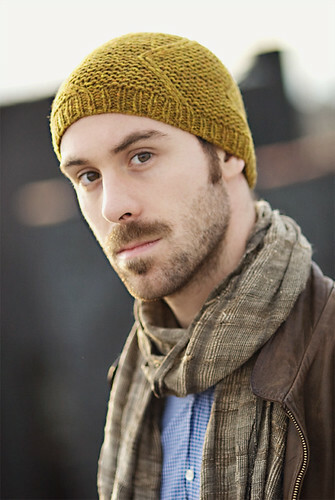 I’ve included links to the pattern and yarn below in case you get the Burnaby bug too. Wishing you all a very happy new year — I’m looking forward to what 2017 has in store! I’m excited to announce today’s release of a new book of my work that we’ve published here at Brooklyn Tweed! Woolens is a project that I’ve been knocking around in my head for quite a while, but it wasn’t until I visited Japan last year that I was inspired to get the project off the ground. Looking back now, I can definitely see the influence of that trip in both the projects and the imagery inside these pages! The book is dedicated to the humble knitted accessory – small, portable projects that are meditative to knit and accessible to adventurous beginners. Inside you’ll find a mix of all of my favorite knitting traditions: colorwork, cables, lace, and textured stitches. We’ve put together a book preview (see below) if you’d like a sneak peek at what you’ll find inside — and if you’d like to check out each individual project more in depth, you can find them all here. The book is available in print, as well as a print + e-book combo, and I’ve signed the first 250 copies that will be shipping from our Portland HQ today!
. I look forward to seeing what unique creations you’ll make with these designs, and I hope you like the book! I love books. I love the way they feel and smell. I love the tactile properties of different kinds of paper between my fingers. I’ve daydreamed about bringing printing into our offerings at BT for quite a long time, so I can’t tell you what a thrill it is to be holding a printed copy of Olga Buraya-Kefelian’s CAPSULE Collection for Brooklyn Tweed in my hands today. Working with designers has become one of my favorite parts of my job over the last few years, both with our Wool People collections, as well as our in-house design team. As we’ve continued to produce design collections, however, I’ve often found myself wishing we could provide a designer with a broader platform to share more than just a single design at a time. Within my own design process I know that a single idea never exists in a vaccuum — it’s almost always accompanied by related concepts and variations which are often left unexplored. The CAPSULE idea was born from my desire to facilitate a deeper collaboration with a single designer and to see what one person might do when given an opportunity to realize their own vision for an 8-10 piece “wardrobe” of knits. The name CAPSULE, of course, references the idea of a capsule wardrobe, a small collection of essential, timeless pieces that are versatile and interchangeable, giving the wearer options to create several outfits from a modest, well-edited collection of garments. This idea has always resonated with me — doing more with less — especially in this unprecedented era of fast fashion. When I started thinking about designers who might be the perfect fit for the Capsule idea, Olga was the first to come to mind. To me, she is truly a unique voice in the world of knitting and someone whose dedication and creative conviction I deeply respect. I remember being very excited to see what kind of beautiful knitted objects she would create as the first designer to be featured in this new series, and she did not disappoint! Collaborating with others and incorporating a dialog into the creative process has become one of my favorite ways of working. As much as I require and adore solitary creative work, I’ve learned that opening yourself up to different perspectives and ideas throughout your process can be equally important, and almost always helps you make that extra creative leap when you find yourself stuck in your own head. In 2012, Olga and I started our conversations about what this collection might look and feel like. The work evolved slowly and organically through creative dialogue and spanned a couple major geographical moves for both of us (Olga from Japan back to the states in mid-2013, me from East to West Coast this year), getting pushed down the calendar further and further as we figured out how to make this new print format come together. New ideas always take time, and we both agreed to give this one as much time as it needed until it was right. Olga and I both love street fashion and thought it would be fun to highlight the funky flair of her pieces in this type of setting for the collections photoshoot. We were still in Brooklyn at the time, so on shoot day we set up camp at a friend’s home in an historic architectural district of Cobble Hill (the same location we used to shoot our BT Kids collection), and rambled around the neighborhood using the beautiful pre-war architecture, brick facades, and ornate details of the neighborhood as a backdrop. My love of the iconic NYC stoop is very much in evidence, as you’ll notice! It’s been such a new and fun challenge to design a book for print, making a beautiful object that can function as a source of inspiration in its own right as well as displaying Olga’s beautiful work. I worked closely with book designer Jenny Trygg on the print edition and we spent many happy hours geeking out over paper and cover finishes, typefaces and layouts. I’m looking forward to seeing what you all think about our first experiment with print. Here at BT HQ we’re definitely excited to be working on this new publication. And as ever, I’m looking forward to seeing how some of you will make Olga’s garments and accessories your own. A very special thanks to my talented friend and colleague Olga Buraya-Kefelian for making this experience so memorable and rewarding. I know I speak for both of us when I say that we really hope you enjoy it! Hello Bonnie, and welcome! So glad to chat with you this morning. Hi Jared. Thanks for having me. You have a fine arts degree and work in several media other than wool. Can you tell us about your other art forms? I’d love to! I’ve been drawing ever since I was a child and usually have several sketchbooks in progress at any given time. In one (called “Lost & Found”), I draw small found objects like seeds, buttons, or leaves. Clouds and hills are also favorite subjects. I’ve done lots of collages, too, as well as paintings. A few years ago, I became hooked on embroidery—a medium I hadn’t touched since high school—after taking a class with Rebecca Ringquist at Squam Art Workshops. Now I do quite a lot of abstract embroidery and stitch at least a little every day. Did you go to art school? Grow up in a creative family? Or are you self taught in your various creative pursuits? I received my M.F.A. from the University of Chicago. As a knitter, I’m mostly self-taught, though I’ve taken classes on particular subjects here and there, such as finishing techniques, sock knitting, and crochet. Yes, I did grow up in a creative family. Though my mother doesn’t knit, she sewed a lot when I was growing up, making clothes for herself and for me and my sisters. She’s an amazing problem solver, which is a big part of creativity. All of my three sisters have multiple creative pursuits: weaving, knitting, crochet, dyeing, spinning, felting, collage, jewelry making, punch needle embroidery, and rug hooking. I’m probably forgetting something! Though my brother, the youngest, isn’t involved in any fiber arts, he’s creative too—mainly woodworking, also photography. How did you specifically come into knitting and designing garments? I taught myself to knit in my twenties using The Sweater Workshop by Jacqueline Fee. You learn all the techniques you’ll need for a sweater by making this funny-looking sampler knit in the round. Then you can plan out your own raglan, based on your gauge and the measurements you want. It was a great way to learn to knit—very empowering—but that was years before I actually learned how to follow knitting patterns. I got into knitwear design with accessories at first (no grading involved! ), then later sweaters. Mostly I’ve learned by reading books by people like Shirley Paden, Barbara Walker, Maggie Righetti, Deborah Newton, Sally Melville, Ann Budd … as well as studying individual patterns by many other designers. Did you start by making original designs for yourself before self-publishing your work? Or did you jump right in? In the beginning, they were either for myself or gifts for others. One of my first published designs, a lace scarf, was originally a gift for my brother-in-law’s mother. I liked it well enough to publish the pattern. Things sort of snowballed from there. How do you balance your time amongst the arts and how does one form influence the others? Balance can be elusive, don’t you think? Yes, I guess that was a bit of a trick question! Oh, I think it’s a great question! Finding balance is a challenge everybody faces. Sometimes I achieve it and other times not so much. I think the key is to have reasonable expectations. Some days I put my artwork on the back burner to focus on finishing up a new pattern. Other times, I need to back away from the knitting needles and spend more time on my embroidery or drawing projects—or else I start to feel “out of alignment” as an artist. Knitting generally requires a lot of patience—not to mention ripping back and starting over. So I’d say it’s influenced my artwork by helping me to be less self-critical and more easygoing—to enjoy the process more and accept the ups and downs. Those are pretty great lessons for any creative, and I agree, knitting helps teach them – whether we like it or not. That’s so true. I was about to say, wouldn’t it be fantastic if we never had to rip back and could envision perfectly right from the start how all the parts of a design will work together? But on second thought, I wouldn’t want the creative process to be too easy—that would be boring. And I would miss that 4 AM insomnia where my mind keeps trying to solve a particular problem! You live in a beautiful part of the world (the Pioneer Valley in Massachusetts) that’s inspired artists for centuries. How is that landscape important in your work? I feel very lucky to live here! I’m surrounded by distant mountains and hills and there are so many woods, hiking trails, conservation areas, streams, and rivers. It’s really a nature lover’s paradise. 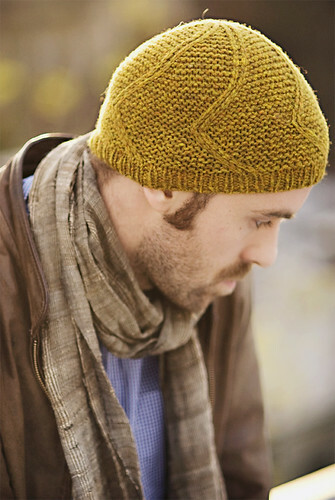 These seem like natural inspiration points for your new design in Wool People 8, the Sawmill River hats. Can you talk a little more about the process for how this design came about? 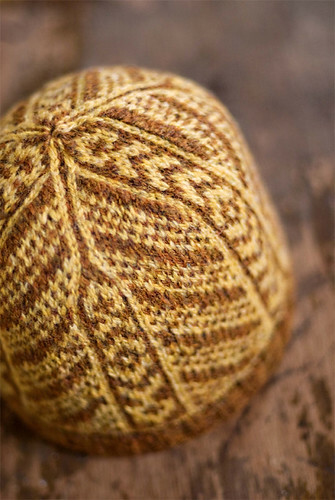 When I was swatching for Sawmill River, I really liked the look of the large cable motif. It reminded me of streams of water. But I felt something was missing, so I added similar but much smaller cables on each side. And then I felt everything clicked—the design had a visual and conceptual unity. One thing I love about your work is how subtly original your stitch patterns and motif combinations are. At first glance, they don’t scream that they are unique, but as you look closer, you realize they aren’t often things we have seen before. Can you explain the importance of a stitch pattern in your design work, or describe the way you develop your own? I have a fairly robust collection of stitch dictionaries, and whenever I look at them I can’t stop adding more Post-It notes. I love to swatch without any aim in mind—just for the sheer fun of seeing how a stitch pattern knits up and what kind of yarn it seems best suited to. One thing I’ve come to learn is that stitch dictionaries are only a starting point. Often, modifications are needed to get the effect I want or to make two stitch patterns work well together. By altering a motif to make it wider or longer or shorter, or by adding some contrasting stitches or yarn overs, I can take it from just OK to just perfect. Bonnie, this has been great. Thank you for joining me today and I wish you all the best in your continued creative endeavors! I’ve really enjoyed chatting with you, Jared. It’s an honor to be part of Wool People 8. Curious to read more about this design or get your hands on the pattern? Visit Sawmill River’s pattern page for details. This has been the Part 3 of a 6-part Designer Conversations series with selected creatives from our new Wool People 8 collection. Stay tuned here for more; two interviews will be posted each week! Good morning, Irina! Thanks for joining me today to talk about your work—I’m such a fan. Thanks Jared! I’m very pleased to be a part of these wonderful Wool People collections, thank you for the opportunity! 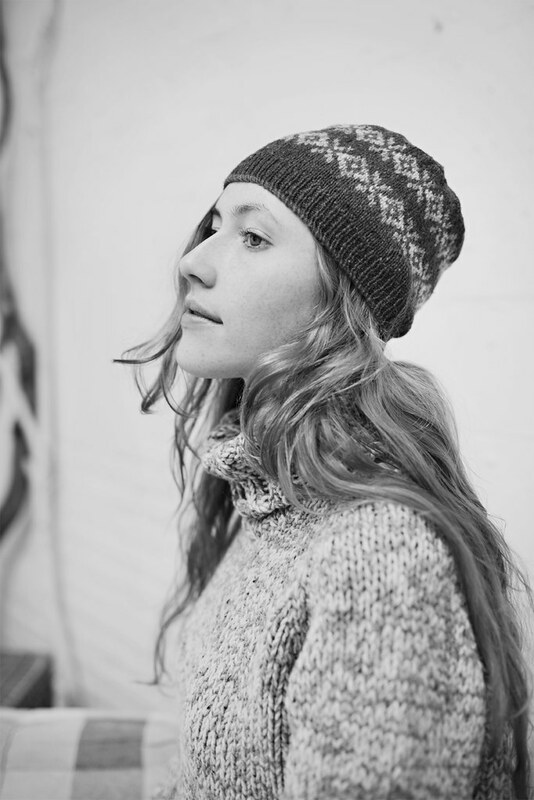 Rambler is your third hat for Wool People—you contributed Scrollwork for WP4 (with a matching cowl) and Gentian for WP6. We’re so glad to have you back again for WP8. I know Rambler is an idea you’ve been playing with for a very long time. Can you tell us about the process for your new design? When I was working on Scrollwork Wool People 4 in the “Wool Socks” colorway, I started thinking how wonderful this color would work for a design with an autumn leaf motif. I started drawing sketches at that time, but nothing solid came from it. Over the next few months, I returned to the sketches again and again, knowing there was something there that I hadn’t locked in on yet. After time, I was able to work up something that I felt ws interesting, which is the resulting Rambler – even though I’ve never worked on one design for so long! What kept you coming back to this idea? What made it finally click? It was the sheer number of sketches I drew in my notebook—which I always keep by my side—that kept the idea percolating at the front of my mind. I find returning to my own sketches again and again for inspiration keeps ideas moving along over time. I do the same—you never know when you’ve accidentally found the solution to an aging design conundrum. Yes! I often spend a long time drawing a single sketch, which ends up unresolved in some way. More often then not, when I return to it later the moment of “enlightenment” comes, and what seemed so difficult receives a simple solution in the end. This was the case with Rambler. Your cable work is so distinctive; you clearly don’t just browse stitch dictionaries and amalgamate motifs. What makes a design come alive for you? Most often I get inspiration in drawing curls and knotwork. Often I find ideas for woven motifs in objects around me. It can be anything from nature, architecture, interior design objects, etc. I draw a lot. Sometimes I come up with different variations of the same pattern, sometimes trying different ways to combine several patterns. Sometimes I start to draw one pattern, and in the end it turns out to be quite different from my original idea. Sometimes a beautiful idea comes right away, and other times it’s a much longer search. But in the end, tangling cables together is always the most exciting type of knitting for me. Can you tell us about your background? How did you get started with knitting and design? I learned to knit at age 12. When I was 15 I made my first sweater. Since then, knitting has been my favorite pastime. In the past I have always chosen to work from knitting patterns with interesting stitch patterns – ones that particularly piqued my interest in design. In the early 2000s, however, I felt I was having a harder time finding interesting patterns to work with. The publications that I had access to in Ukraine published mainly knitting patterns worked in stockinette stitch and fancier yarns. While I like wearing simpler patterns, I tend to get bored knitting them. So in 2003—the year I was on maternity leave and had more free time—I began to invent my own stitch patterns and design accessories with them. Ever since I’ve been sketching and knitting my own stitch patterns, and amassing a nice collection of them to draw from. I would love to someday produce a stitch dictionary with my original motifs. The more I grow as a creative, I realize that my passion is inventing and knitting unique or complex stitch patterns. I like to watch as a pattern emerges in the process of knitting, particularly with intricately woven cables. As I mentioned before, the result is almost always different from the initial sketch, so the element of intrigue remains until the end. My favorite accessory to incorporate my motifs is obviously hats. To me the brim, body and crown of a hat represent a single unit, and I love finding ways to make each flow into the other without breaking the motif, but instead enhancing its interest. I think this all certainly shows in your work, and it’s really inspiring to hear you talk through your design process. Thank you so much for spending some time with me today, and I really look forward to watching your work evolve. Thank you, Jared! It’s really a pleasure to work with you and your team. Curious to read more about this design or get your hands on the pattern? Visit Rambler’s pattern page for details. This has been the Part 2 of a 6-part Designer Conversations series with selected creatives from our new Wool People 8 collection. Stay tuned here for more; two interviews will be posted each week! JF: Good morning, Leila! So good to have you on the “public” side of the blog today, rather than helping me proof my writing behind the scenes at BT! 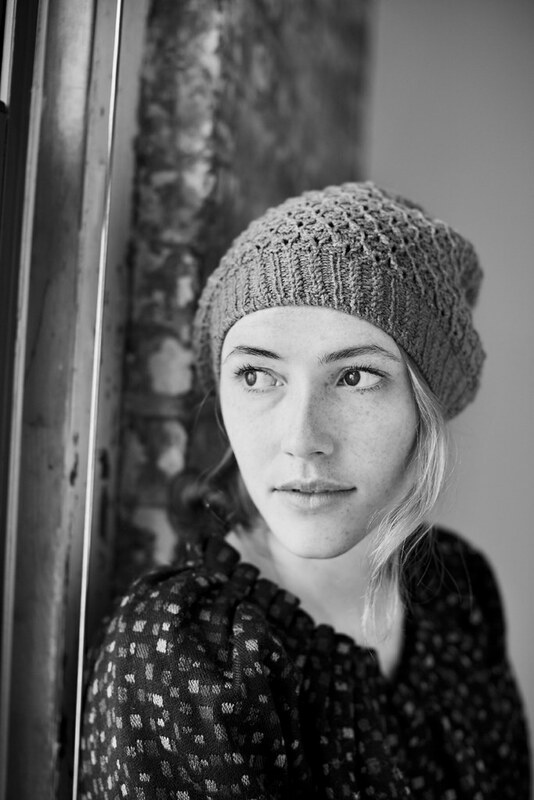 JF: Bough is a really sweet hat and cowl set – I started my own Bough hat immediately after you submitted the pattern because I wanted one for myself! I love the mix of traditional motifs with modern shapes and styling – would you say that this mixing of new and old is a steady feature in your work? LR: It really is. I can (and will, often) just sit and pore over old knitting books and stitch dictionaries for hours. It’s cliché, but they’re my go-to source of inspiration and I return to them again and again. There’s something to be said for stitch patterns that stand the test of time and can be seen in designs from ten years ago, twenty, and even further back. LR: Japanese stitch dictionaries and pattern books are also particularly fascinating, in large part because my favorite authors (Yoko Hatta, Toshiyuki Shimada, Michiyo, to name a few) seem to have as much of an obsession with the classic motifs as I do. And they’re masters at turning stitch patterns we’ve all seen over and over into something completely new. JF: The Arbor Vitae (Tree of Life) motif is one of my favorite traditional cable motifs – I know you love it too. Was this stitch the “seed” that grew into the rest of the design? Or did you start from a different inspiration point? LR: It was! I’ve come across different variations of it and have been wanting to include it in a design for years. I also wanted to change up the repetitive structure of the traditional motif a little bit — making the progression slightly less stamp-like over the course of the knitter’s project — and eventually, many swatches later, ended up with a shapely little tree. I tend to start with one primary element or idea, and then have a lot of experimentation to figure out how to best support that element. The tricky part is balancing it all without going overboard with too many random details. I’m learning that restraint can make the difference between an okay design and a really strong one. JF: It’s so true. Bringing an editing eye to your own work is essential. I think when we are creating knitwear by hand, because it takes a significant amount of time and effort, it is easy to try to pack too many ideas or details into a single design. LR: Taking a balanced set of motifs from one type of project (a hat) to its complement (a scarf) is an interesting exercise, too. Proportion and scale against the shape and dimensions of the finished piece is an important thing to keep in mind. 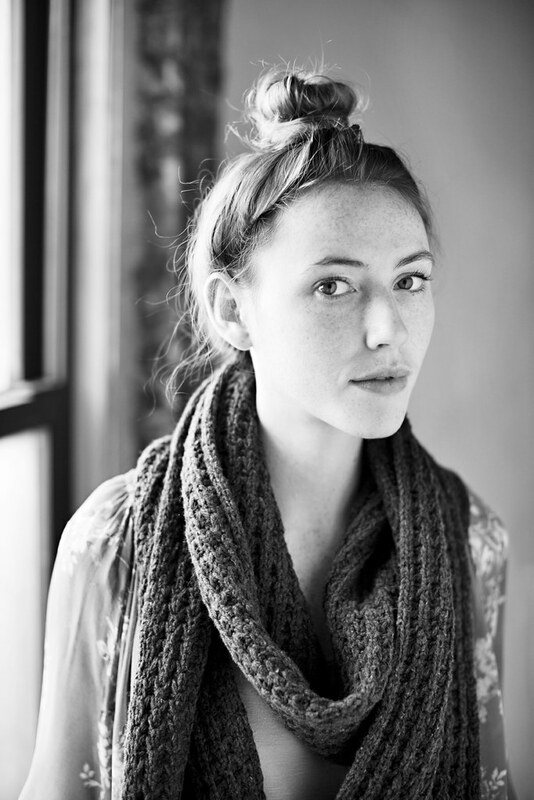 I cheered when I read your blog post about striving for harmony in the details of your Bray pullover — music to my ears. We could probably talk about this for weeks. JF: Because I work with you every day, I get the pleasure of witnessing the evolution of your design work in real time. I know you’ll often create prototypes, or multiple versions of something as you work towards a completed idea. Can you talk a little bit about this process? Do you feel that there is a sort of “searching” aspect that you require to bring out your best work? LR: Whenever I complete a project I think about all the million different things I’d change about it, if I were to knit it again. Bough started with a hat I made for a gift last year – that one featured the Tree of Life along with a few gansey patterns and small, squiggly cables. Still obsessed with the Tree pattern, I then cast on for a cowl, ditching the gansey and squiggles in favor of simpler seed-stitch columns and framing. I never finished that one, because I started another hat, which eventually became the final version of Bough. After completing the hat I decided to revisit the cowl to see how I could make the trees and cables work in a long, circular loop. LR: If I showed you the number of Illustrator files of different chart “mock-ups” I have for this hat, you would probably laugh. JF: It would be a laugh of solidarity, for sure! LR: And there are probably twice as many for the cowl. I’m grateful that we have tools like these at our disposal to help with the design process; otherwise, I’d have a bigger pile of unfinished prototypes than I already have, and meeting deadlines would be much more challenging. JF: Yes, technology is so incredibly helpful for design. 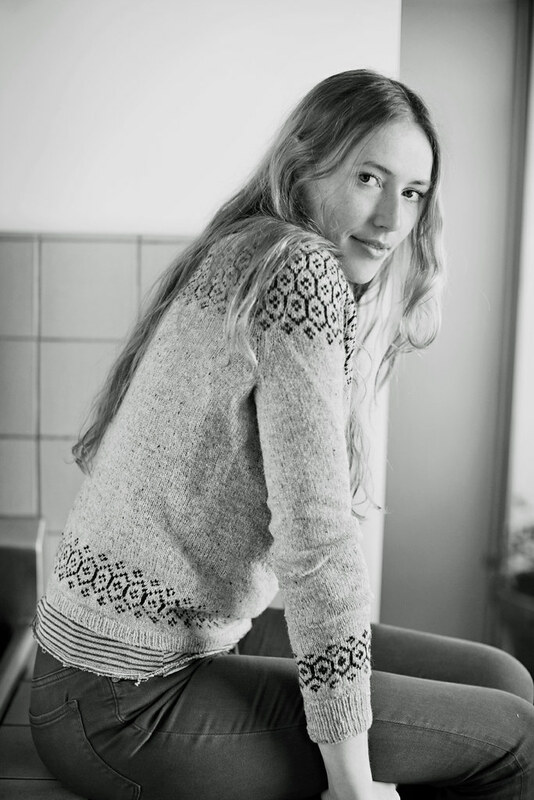 Do you work primarily in Illustrator when developing knitwear? Do you use any other programs? LR: I have a strong preference for charts over written instructions in a knitting pattern, so Illustrator (which, as you already know, is my default program for creating charts) is always open during development of a design. I’ve also found spreadsheets useful, though I like to keep things on the simpler side—a lot of what I do builds off of pretty basic shapes and construction methods that don’t require a lot of number-crunching. I focus mainly on playing around with stitch patterns and motifs, and what I hope are pleasing combinations. I will sometimes use Photoshop to cobble images of my swatches together to help get a visual for how something would look over a larger area of fabric. JF: This has been fun – thank you, Leila! LR: Thanks so much for sharing your space with me, and for including my design in this volume of Wool People! I hope knitters find their projects enjoyable to make and wear. The kits include five hand-wound mini-skeins of Loft in colors and amounts corresponding to your chosen colorway. We’ve also included a physical copy of the Seasons pattern – an 8-page folio printed on saddle-stitched card stock. Kits ship in our signature BT packaging. I remember falling in love with this banded colorwork motif when I visited Shetland in the Summer of 2010 and saw it on a pair of hand knit gloves that I purchased from one of the regional knitters there. I’ve since swatched it several times for different design ideas, and it finally found its home with this one. I used this motif in much of my early experimenting with multi-colored stranded knitting from the Loft palette. When it was time to decide which colorway to use for the final sample – I just couldn’t pick one. It was there that the idea of the “Seasons” were born. The four final versions were inspired by color families from each season. We hope you like them – happy kitting! Resources: Seasons Hat kits are available for purchase on our web site here. Hat design by Jared Flood. Packaging and printed pattern are printed/produced in the US. 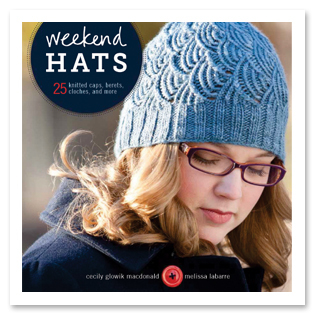 I have new hat designs in a couple of Fall publications that were recently released. Designing for books has such a long timeline – both of these hats were designed over a year ago – so it’s always a funny thing ‘releasing’ them to you, when they feel like such distant memories already! The Wanderer Cap is part of a new hat collection that was curated by my friends Cecily Glowik MacDonald and Melissa LaBarre called Weekend Hats. Interweave hasn’t officially released this title yet, but it is available for pre-order. The hat was knit with Shelter in our Hayloft heather. It’s funny looking back on this after having just released Rosebud… I never seem to tire of using Garter Stitch as a backdrop for smaller, cabled details. The base of the ribbing utilized a crisp 1×1 tubular cast-on. A good tubular cast-on always delights me with its charm – such a clean, perfect way to start a new piece of fabric. 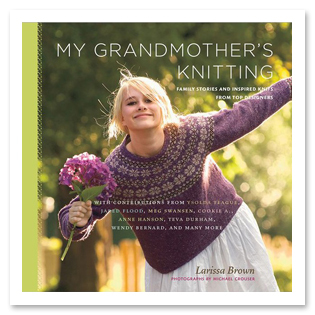 This hat design is included in a wonderful new book by Larissa Brown called My Grandmother’s Knitting. I’m always so excited when I see a knitting book that thinks outside of the box and brings something really unique to the crowded bookshelf. Larissa’s books always have that quality, and this one is no exception. Larissa is interested in stories. With this work, she set about interviewing well-known designers in our industry to learn more about their family histories, and who it was that deeply effected their early growth and development as a Creative. Many designers share sweet stories about who it was that shaped their appreciation for our craft, and/or their artistic practice in general. I speak a little about the creative influence that both my father and mother had on me while growing up. The Tilden hat has a simple 2×2 ribbed brim and is constructed with 6 wedge-shapes that are staggered as they are shaped for the crown. It’s a non-traditional type of shaping that creates the subtlest bit of pointiness at the top of the crown (easily steamed flat, if desired). It’s a bit of geometric whimsy, playing with vertical lines and 45-degree angles throughout. I hope you’ll enjoy either design, if you do choose to add either of these books to your libraries. For more info about either title, click the cover images below. Resources: The Wanderer Cap pattern can be found on Ravelry here; Tilden’s Ravelry page can be found here. Yarn for Wanderer is available here. 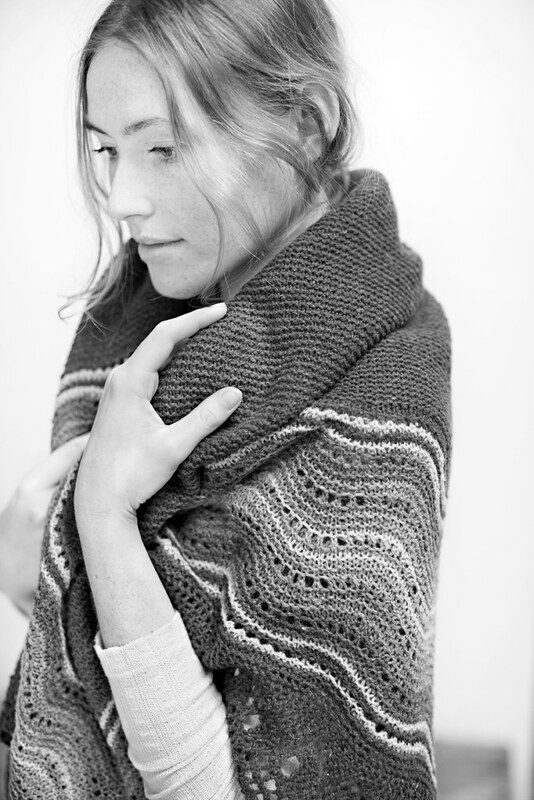 Yarn for Tilden is available here. For links to either book mentioned in this post, please click the cover images above. The first four images in this post are original photographs and not featured in either publication.